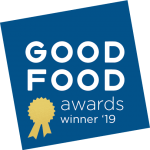 January 14, 2019—Caffe Ladro received the Good Food Award for its Ethiopia Limu Organic coffee at the 2019 Good Food Award ceremony in San Francisco, CA last Friday, evening, January 11th. Ryan Rabaca, Ladro’s Head Roaster, accepted the award, which was bestowed on just 15 coffees submitted by roasters from across the USA. Over 2,000 specialty food crafters in 16 categories vie for the Good Food Award winner seal annually. 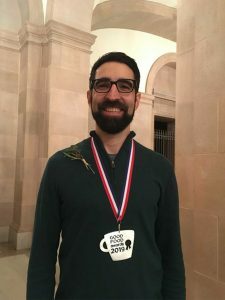 Caffe Ladro achieved finalist status in 2018, and ascended to winner this year. This coffee is a light roast with taste notes of red grape, dried fig, and orange blossom. The entire Ladro staff looks forward to sharing this coffee with customers, friends and family. 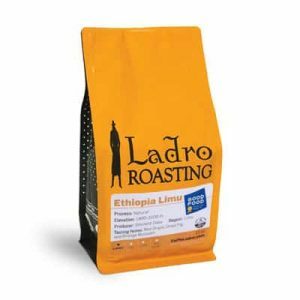 It is available at all Caffe Ladro locations and online at CaffeLadro.com. 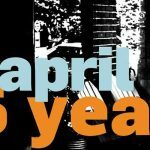 The following local restaurant news piece highlights this coffee, and Seattle Coffee Scene piece highlight this coffee, too. Meet all the Good Food Awards Winners of 2019. 9th Good Food Awards Recognizes 220 Food & Drink Crafters from 34 States & Washington, D.C.
San Francisco, CA (January 11, 2019) – The nation’s leading food crafters, grocers, chefs, journalists and activists gathered tonight at a gala Awards Ceremony in San Francisco to honor the 220 Good Food Awards winners of 2019. 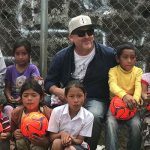 An annual recognition program now in its ninth year, the Good Food Awards celebrates American food and drink crafters who demonstrate a commitment to creating tasty, authentic and responsible products and in doing so, bettering our nation’s food system. Each of the 2019 winners demonstrates both a mastery of their craft and a commitment to maintaining exceptionally high social and environmental standards in their work. This year, the Good Food Awards distinguished makes in sixteen categories (beer, charcuterie, cheese, chocolate, cider, coffee, confections, elixirs, fish, honey, oils, pantry, pickles, preserves, snacks, spirits). The 2019 winners come from 34 states and Washington, D.C., rising to the top amongst 2,035 entries in a blind tasting with 262 judges held in September. The highest scoring entries were underwent a rigorous vetting process to verify they were not only exceptionally tasty, but met the sustainability and social responsibility criteria required to become a Good Food Award winner. Of the 220 winners selected from 324 finalists, 55% are first time winners. The greatest number of winners come from the Golden State, followed by Oregon (25), Washington (19), Massachusetts (12) and a three way tie between Virginia, New York and Colorado (11 each). Following closely were Vermont and Missouri (10 each). The full list of 2019 Good Food Award Winners can be found here.